With the world population expected to surge from 7 billion to nearly 10 billion people by 2050, food production must grow by 70 percent to meet the demands of global hunger. 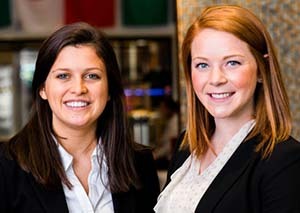 That’s no simple feat, but Krannert undergraduates Abby Adair and Sydney Gray are searching for possible solutions through the Land ’O Lakes Global Food Challenge. Actively engaged in agriculture and sustainability, Abby and Sydney were among 10 students from five different universities who spent 11 weeks last summer at key Land ‘O Lakes locations, Washington D.C., and Africa on a paid fellowship as 2016 Emerging Leaders for Food Security. Abby, now a junior majoring in management, feels a personal responsibility to care for the planet and its citizens. She has been inspired to improve access to nutritious food by her work in food shelters and by the experiences of family members who teach in low-income communities. “When I think of the Global Food Challenge, two things really come to mind: sustainability and nutrition,” Abby says. “We're running out of land to produce the nutrition that we need, so my idea is using cricket flour as a protein alternative. Sydney also is a junior at the Krannert School, where she studies accounting and finance with a concentration in international business. Drawing on her international travels and academic background, she hopes to bring valuable strategic solutions to today’s agricultural challenges. “When I began this journey, I felt a little unprepared because of my lack of knowledge in the agriculture industry,” Sydney says. “Many people think that the issue of food security can only be addressed by agriculturally sound minds, but I’ve learned that it’s necessary to address such a complex challenge with multiple perspectives, knowledge bases and ideas. To learn more about the Global Food Challenge and Abby and Sydney’s contributions to the initiative, visit foodchallenge.landolakesinc.com.